Each year, countless dogs are sent to animal shelters and are forced to be put down when they show aggression towards people. Sadly, this behavior can quickly turn deadly when an adult or child is viciously attacked, causing many individuals a great deal of pain and suffering. Instead of allowing your dog to exhibit aggressive behavior, be quick to immediately correct any behavior that can be seen as threatening. Also, be sure to keep your dog on a leash in all common places and consider erecting a fence to prohibit him from roaming at will, when most dogs are subject to attack bystanders. In addition to correcting your dog's behavior, you may find it necessary to also correct the behavior of individuals who antagonize your animal and may lure them into an attack. For starters, you should be aware of how to judge aggressive behavior. This is especially the case if you own a certain breed that many feel is aggressive by nature. Although falsely accused, dog breeds such as pit bulls, German shepherds, Rotweilers, Akitas, and other breeds are considered aggressive or dangerous, so it is essential for these dog owner to ensure their dog is a positive note for the breed. Signs of aggressive behavior include barking, growling, snarling, showing teeth, jumping, or lunging against a leash or barrier. Also, aggressive dogs are usually territorial, so they may crowd people or attempt to push individuals in a corner. If you are raising a puppy, regardless if he is showing signs of aggression, you should be sure to properly train your dog to behave properly around people. This is critical, since it is easier to instill these thoughts in a puppy rather than an adult. Some owners mistake potentially aggressive behavior for cute puppy play. If your puppy is showing signs of aggression, he should immediately be corrected to prevent problems later on down the road. One of the best ways to stop aggression towards people is to begin a rigorous socialization program. Allow your dog to meet different people, both adults and children, but be sure to have him properly restrained on a leash. Also, bring individuals into your home and begin an in-home socialization process. Again, leash restraint is critical. Start with introducing your dog to a single person, and then increase the numbers. Often, dogs that are crowded with people turn their fear into aggression. Usually, dogs that have been abused or mistreated and later adopted retain their aggressive tendencies. Keep in mind that your dog was conditioned to be aggressive, and he can be conditioned to lose the aggression as well. Work diligently with your dog and provide a soothing environment for your training sessions. When you begin training sessions, start with yourself and another individual with whom the dog is familiar. 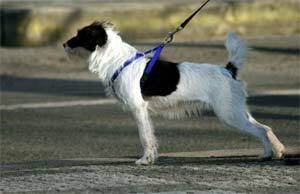 Have your partner take the leash and, using slow, deliberate steps and a calm voice, approach the dog. Provide the dog with verbal praise, pets, and even treats. Once your dog accepts your presence, switch with your partner. Use different scenarios like allowing your dog to greet an individual at your door or meeting someone on a sidewalk. Until your dog can be trusted to avoid aggressive behavior, avoid hectic, bustling places that can easily frighten your dog and bring forward the aggressive behavior.